WASHINGTON, D.C. -- As the image of U.S. leadership abroad continues to suffer, there are signs that China's leadership is gaining more clout. 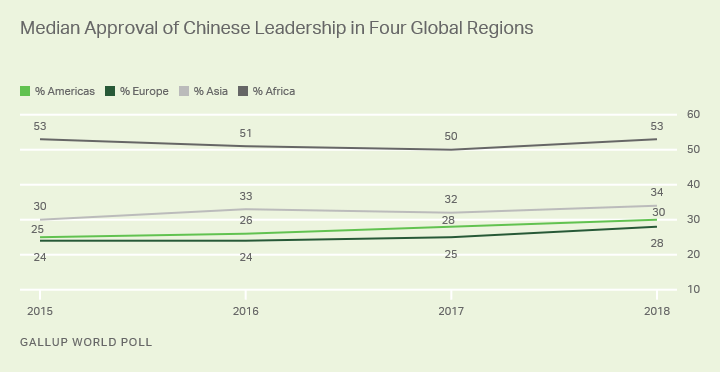 In 2018, the median approval of China's leadership across 134 countries stood at 34%, a modest increase from 31% in the previous two years. 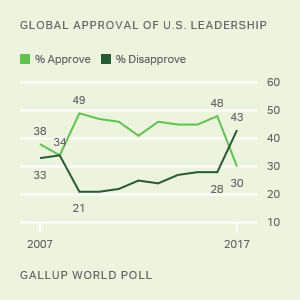 Approval of U.S. leadership plummeted around the globe during President Donald Trump's first year in office and has yet to recover. Coupled with China's efforts to expand its global influence, some experts warn that U.S. global influence is at risk. In 2017, the U.S. and China were on nearly equal footing for the first time in the decade-long trend. And in 2018, approval of China's leadership topped the rating for the U.S. Despite these concerns, there is no evidence that China's leadership is considered more attractive because U.S. leadership has declined. 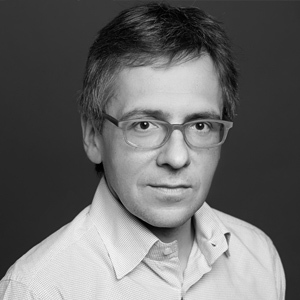 At least in the short-term, leadership approval -- a proxy for soft power, the use of economic or cultural tools to gain influence, rather than military force -- is not a zero-sum game. China, like the U.S. and other major global powers, earns its highest ratings in Africa, where the median approval of 53% is one percentage point higher than the median approval for the U.S. Within its own region, Asia, median approval of China's leadership is 34%, and in the Americas and Europe, it gets approval ratings of 30% and 28%, respectively. All these numbers are up modestly since 2017. On a country level, approval of Chinese leadership increased by 10 percentage points or more in 14 countries between 2017 and 2018. These countries represent a mix of regions -- including some of its own neighbors such as Mongolia. But this list also included U.S. neighbor Mexico, where trade relations warmed in 2018 as the U.S. and Mexico continued to wrangle over NAFTA. Approval ratings declined by 10+ percentage points in only four countries, including 15- and 16-point drops in Kazakhstan and Cambodia, respectively. The change in Cambodia likely has economic origins. However, for Kazakhstan, the decline in approval is likely related to China's treatment of the country's Uyghur ethnic group living in China. China's leadership remains a great unknown to many around the world. A median of 30% worldwide report they do not know enough about Chinese leadership to rate it. In the Americas, the percentage of the population without an opinion on Chinese leadership is highest, with 36% saying they don't know enough to form an opinion about the issue. Not surprisingly given the high median level of approval for Chinese leadership in Africa, the region plays host to eight of the 10 countries with the highest levels of approval for Chinese leadership. However, China earns the highest marks in neighboring Pakistan, where 73% approve of China's leadership. Pakistanis' affinity for Chinese leadership is likely related to China's extensive economic investment in the country as well as China's traditional support of the country in its past conflicts with neighboring India. Again, given the low median approval for Chinese leadership in Europe, it is not surprising that seven of the 10 countries or areas where people are least likely to approve are in this region. However, Vietnam has the lowest approval rating of China's leadership, 6%. China and Vietnam have a historically troubled relationship and are currently involved in a conflict over economic development rights in the South China Sea, likely contributing to low opinions of Chinese leadership among the Vietnamese public. 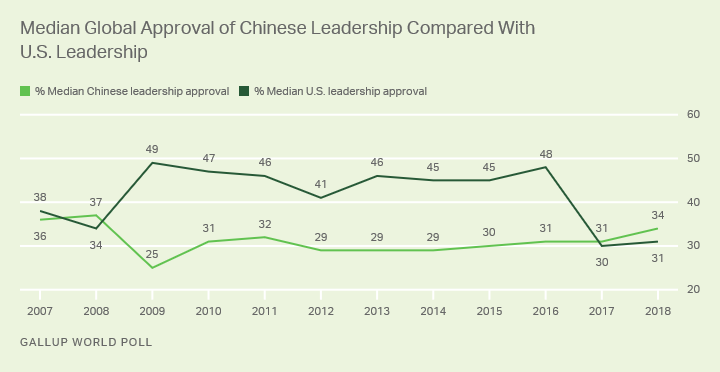 Additionally, two Asian powers register particularly low levels of approval for Chinese leadership. Sixteen percent in both Japan and India approve of China's leadership. However, in India, a large percentage (43%) of the population has no opinion, while in Japan roughly a quarter, 24%, of the public had no opinion. To complement its rise as a great economic power, the Chinese government has sought in recent years to expand its global influence in other spheres. 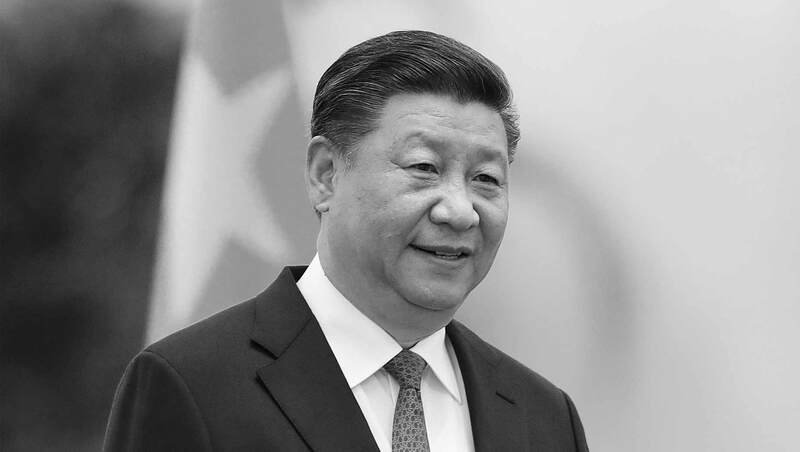 In addition to massive investment in its military and large-scale economic projects such as One Belt One Road, this approach includes a diplomatic angle that emphasizes national sovereignty and rejects foreign meddling in the name of human rights or democracy. 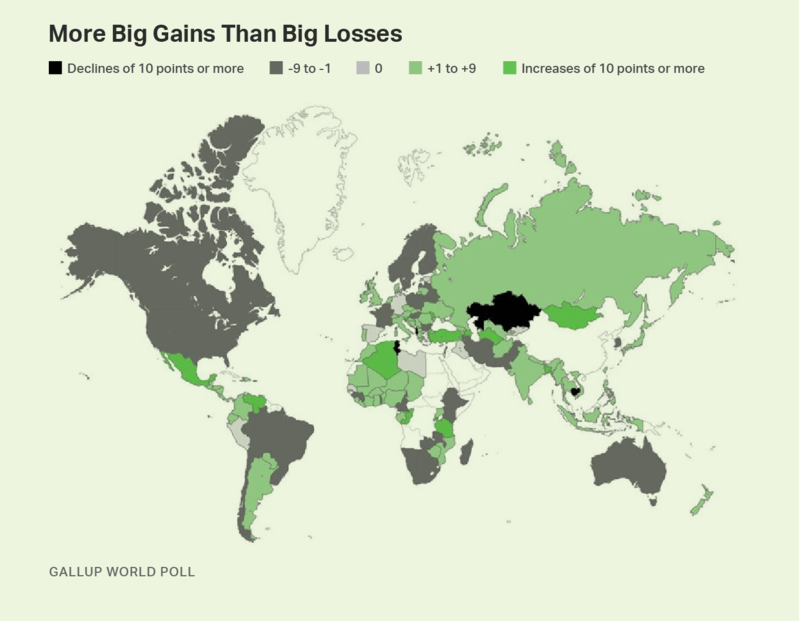 After years of these efforts, the image of China's leadership is on somewhat firmer footing, while global sentiment toward U.S. leadership remains near a record low. It is currently unclear if this firmer footing will continue to give China's leadership a leg up over U.S. leadership.